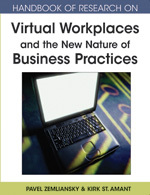 This chapter examines the critical task of providing client support for virtual environments. The vast majority of information workers are not familiar with virtual solutions and need guidance on how to best utilize and integrate this technology into their day to day operations. A company’s ability to manage information effectively over its life cycle, including sensing, collecting, organizing, processing, and maintaining information, is crucial to the long term success in a global economy. Over the past few years, the case study organization has been actively engaged in building, deploying, and managing the procurement, education, and strategic direction for a Fortune 500 company. The success of the studied organization can be seen by reviewing the metrics as the collaborative content continues to grow by an average 28.08% per month and the usage rates have grown by 21% per month. This growth rate was accomplished by focusing on building communities of practice, physical and electronic training programs, promotional road shows, self-service procurement processes, templates, pattern libraries, and an evolving online environment that supports the business user every step in the learning process. Usage Metrics: Usage Metrics are measurements on the amount of usage which may include page views, downloads, memberships, or subscriptions of content. Self-Service Collaboration: Self service environments allow the end user to gain access to the client-support information through the Web browser. Information and training can easily be pushed to the end user for consumption. Content Metrics: Content Metrics are measurements of the amount of information held within the collaborative environment or knowledge store. Collaborative Environment: Collaborative Environments are designed for distributed teams which can be defined as groups of people that interact through interdependent tasks guided by common purpose, and work across space, time, and organizational boundaries primarily through electronic means. Client-Support: Client support reflects the efforts of an organization that provides “customer” oriented services, such as, training, best practices, documentation, and user guides. Information Worker: Information Workers are individuals who work with information instead the physical objects of labor. Information workers are individuals who create, manage, share, receive and use information in the course of their daily work, including those who act and react to information.